Crunchy. Not like Captain Crunch, but like the first time you step on a cockroach. It is a sound that stays with you and you might dread to hear it again, but sometimes, you gotta show the lil’ critters who’s on top of the food chain (dolphins, of course). 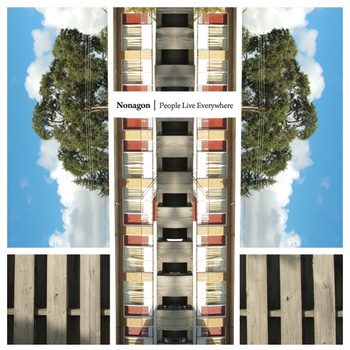 Nonagon‘s 5 track EP, People live everywhere, is not as disgusting as a cockroach killing spree (nor as futile – bastards keep multiplying), but it certainly is in the right notch of lo-fi dissonance that might make you think of the classier math core bands of yesteryear (June of 44, Shipping News) with the anger and frustration that a lot of people are not expressing today. Yes, it’s angry music. 15 minutes of pure, unadulterated anger that probably sprained a couple of wrists and ankles and made the rest of the band buy the bassist a couple of stiff drinks. One for him, one to cool down his fingers after that impressive fretwork. After a mechanised voice announces “here we go, fellas”, a fast, steady bass (seriously, that’s reyt good) sets a funeral pyre called ‘Vikings’, where the ramblings and screams are only superseded by the odd time signatures that this trio pulls on us. It’s a fast sort of slow, this one, like molasses on fire. ‘Fresnel lens’ (which you can totally get for free in our Mix CD) starts slower, kinda of wondering if it should try and outrun a boulder rolling down the hill. The guys go for it. You already know the bass is great, right? Well, the rest of the band aren’t slouching around either, they go for it and all of a sudden, it’s the summer of ’93, Kurt Loder only looks 65 years old and MTV has Stone Temple Pilots, Faith No More are shouting about caffeine addiction and a band called Frodus just met and started rehearsing. ‘The swifts’ is more straightforward (not that much time travelling), very garage and the main vertex of this thrashy pinwheel. “It’s still not easy“, they shout. I wouldn’t even try to play this, dudes. ‘Fadeout’ is a nifty instrumental track and although the bass dude keeps hogging the spotlight, there’s some peculiarly satisfying guitar work here, crunchy and dissonant. The drumming gets a chance to show its mad skills too, some fills here and there to keep you on your toes. You note those when you listen to the EP again. You will. Nonagon brutally bids goodbye with ‘Severe Presence’. No haymakers, no suckerpunches, just the good old chair in the head move. This is lucha libre, not WWF theatrics. People live everywhere might be a slight throwback to the hardest sounds of mathcore, but it’s also an album looking back to an era a lot of us are still fond of. Nonagon are a reminder that the frustrations of life can be vented out in musical form. If it’s in a style you obviously love, why not embrace it? Posted in Art rock, Math Rock!, reviewsTagged But is it Post Rock?, Chicago, Dissonance, Nonagon, People Live EverywhereBookmark the permalink.